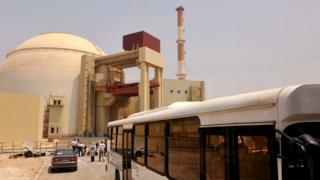 The US says Iran has taken a "significant step" towards meeting its nuclear commitments, by sending a large quantity of uranium abroad. Secretary of State John Kerry spoke after Iran dispatched a shipment of more than 11 tonnes of low-enriched uranium to Russia. Iran signed a deal in July with six international powers. It is designed to demonstrate that Iran is not on the threshold of being able to make an atomic bomb. Under the deal, Iran agreed to reduce its holdings of low-enriched uranium; sharply reduce its quantity of centrifuges - used to enrich uranium - and cut its output of plutonium by re-engineering a power plant. Mr Kerry said Monday's shipment of low-enriched uranium to Russia had tripled the amount of time it would take to produce enough fuel for a bomb - from two or three months to nine months. Will US and Iran shake hands in 2017? "I am pleased to report that we have seen important indications of significant progress towards Iran completing its key nuclear commitments under the deal," Mr Kerry said. Under July's agreement, the International Atomic Energy Agency will decide when Tehran has complied with its obligations. After this, the US and other world powers will begin to dismantle their programme of economic sanctions against Iran.